During the two days I attended the LPGA U.S. Women’s Open this week, I saw many photographers and videographers on the course at Saucon Valley Country Club. I readily admit that I was envious of many of them for two reasons. First, they had credentials to be on the course, and second, they were carrying some big glass! I am a wildlife and sports photographer so I do long for big glass. 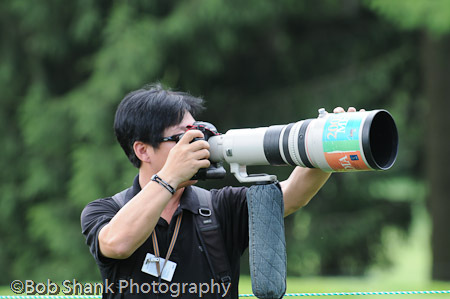 Just seeing those 600mm lenses gets me salivating and coveting my colleague’s glass. As I watched these photographers and videographers, I began to gain much more respect for each of them. They walked the course carrying all their equipment with them and it was hot. Most had a monopod to help keep them steady when taking a shot. They kept moving along, hole after hole, to quietly capture the action with their camera. I still dream of getting bigger glass for my wildlife and sports photography, but I have more respect for what photographers go through to make photographs. They certainly have my respect! I just cannot get over how impressed I was with watching the practice rounds of the LPGA Women’s US Open this week. The women showed amazing skill around the course and quickly warmed up the crowd by their friendliness and good humor. They were very willing to sign autographs and talk with the fans even though they are getting ready for a major event. It was so amazing how approachable and friendly they all were to us. I was definitely impressed. Their amazing skill on the difficult course was equally impressive. Even bunker shots were made with seemingly effortless ease. Meg Mahlon hit a ball into a fairway bunker that seemed to have doom and gloom written all over it. But she calmly approached this hazard lie and with one swing landed the ball within several feet of the pin. Absolutely amazing! These women deserve more attention. I hope you have some time this week to watch the LPGA US Women’s Open. Even better would be for you to witness this event firsthand. It is going to be an exciting and amazing weekend! A good friend of mine invited me to attend today’s practice round of the 2009 Women’s Open at Saucon Valley Country Club in Bethlehem, PA. It was a wonderful opportunity that I just couldn’t pass up. We even had access to his company’s air conditioned tent, which provided cool relief throughout the day as well as refreshments. The players were all very friendly and more than willing to sign autographs. Of course, I took my camera and took lots of photos. It was so fun to meet the women golfers and watch them practice for the upcoming tournament. The two things I noticed were 1) the distance and accuracy of their drives and second shots. This was nothing short of impressive. Long, accurate drives were the order of the day. 2) the consistency of their swings. Consistency is a hard thing to accomplish in any sport and almost any endeavor. Are you consistent, for example, with your photography? These women golfers are extremely consistent, which I guess is why they are on the pro tour, but witnessing this consistency was incredible. And I am going to try now to be more consistent with my photography! One of the absolute most exciting challenges in photography is to try to capture action shots. I like to photograph sports, which requires fast shutter speeds and a healthy number of frames per second. FPS, frames per second, refers to how many shutter releases can be snapped in one second. While this isn’t important for landscape or portrait photography, it is critical for action photography. My Nikon D70 featured 3 frames per second. This was okay, but earlier this year when I upgraded to the Nikon D300, one of the first things I noticed was the increased FPS. The D300 sports 6 FPS and this is noticeable. For example, when I am photographing a runner caught stealing second base, I now can count on my camera freezing the baseball before it gets to the fielders glove as the base runner is sliding into second base. It is absolutely amazing to witness and hear the speed of the D300! Baseball action shots, in my humble opinion, should feature the baseball in the photograph whenever possible. I also like to capture the flying dirt as a player is sliding into a base or a catcher putting a tag on a player who attempts a squeeze play. Action shots require patience and persistence. The challenge this style of photography presents is worth it and I will keep putting myself in places where I can capture the exciting action! I have been a huge sports fan for nearly all my life. I guess I didn’t have much of a choice. My dad played football in high school for a team that won the championship in his junior year and then he went on to play semi-pro football. This high interest in sports was in my genes from the beginning and I wouldn’t have it any other way! I coached baseball and football for the past nine years, which I truly enjoyed. I learned a lot about the great game of baseball and tried passing my insights and love of the game to the players I coached. I also coached the middle school football team, which was a thrill for me. Busy schedules and a desire to no longer be my son’s baseball coach, figuring it was time he learned from someone else besides dear old dad, led me to stop coaching. It was one of the most difficult decisions of my life and one I still have regrets about at times. But I found a way to keep myself involved in the world of sports by using my camera to try to capture the plays on the field. My coaching experiences allow me to anticipate where the action will most likely be taking place so I can be ready to capture the special moment. My favorite sports photographs can be viewed here. 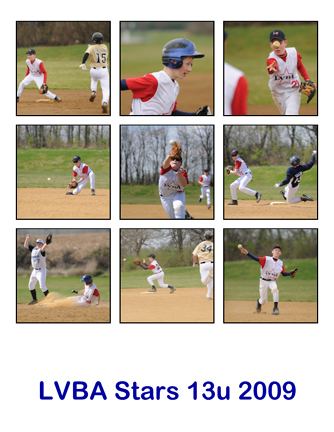 I hope you enjoy viewing these sports photos. Do you think I am successful at capturing the special moments on the field? Do my photos tell a story? Baseball is our national pastime. Some may think it is a boring sport, but I do not agree. The action takes place in spurts but this is true in any sport. Baseball is the only game where the defense is in control of the “clock.” The pitcher holds the baseball in his hands, grips it in his glove, and waits for the sign from his catcher. Meanwhile, the infielders are getting ready to implement their prep step so they will be prepared for the exact moment the ball is put into play by the batter. In just this short amount of time, I can think of a variety of photographs that could be fun to capture: the pitcher taking the signs, the catcher giving the signs, an infielder blowing a bubble with his chewing gum as he gets ready, the third base coach giving the hitter his signs, or the umpire pointing to the pitcher to indicate now is the time to play ball! The purpose of a photograph is to tell a story. Who is winning the game? Is the pitcher in a bind? Did the base runner successfully steal second base? Did the batter hit a 3-run dinger? What was the call of the umpire? Is the manger cool, calm, and collect; or is he pacing up and down the dugout or chirping at the umpire? You see, baseball is a great sport to photograph. I also am learning that the background in a photo is crucial. Chain link fences, parking lots, and power lines can all distract greatly from an action photo. There are a few options that we have at our disposal as photographers who want to eliminate these distracting backgrounds from our photographs. First, we can utilize a shallow depth of field where just the main subject is in focus. Using a large aperture (low numbered f-stop) we can cause the background to be blurred in the photo. This works very well with backgrounds that are of the same color. Another option is to zoom in on the subject, thereby eliminating most of the extraneous and distracting backgrounds. Obviously a large and powerful lens is needed to make this possible. Many photographers simply do not get close enough to their subjects. They think they have to get each and every detail in the frame. You can, however, create some extremely interesting and amazing shots by zooming in even more than you think is normal. And the more you zoom in, the more you eliminate the possibility of a background ruining your photograph. The other option is to consider the background even before setting up to photograph a play. Is there a fence back there? Are parked cars in the background? Can you remove that house out in right field by moving down the line twenty feet? This past Saturday our nephew, Shane Rosenberry, was in a wresting tournament at Whitehall. It was my first attempt at shooting the sport of wrestling with my camera. I thoroughly enjoyed the challenge and learned a few things along the way! One obvious lesson was that the lighting in a gymnasium is not the best for photography. Even with my fast 70-200mm lens with an f-stop of 2.8 I had to bump up my ISO to 400. I was able to capture a few decent photos and you can check them out by clicking here. I continue to learn more and more about the fascinating art of photography! Our upcoming PA Elk Photography Experience will be taking place the first full weekend in February. I am looking forward to this trip and I am sure we will have a great time! This past week, over the New Year holiday, we saw a lot of elk. The cows were herded up in large groups and stayed in the same area for two days before moving to a new location. We didn’t see all that many bulls, but we did manage to see 7 nice bulls. I will hopefully post a few photos from this trip in the next day or so.